Considering all the rumors I’ve heard recently about a quad core Samsung Galaxy tablet with a 11.6 inch display, Bob Freking’s concept below is very close to reality. He created a device called Samsung Galaxy Tab 11.6, a tablet that’s a direct rival to the iPad 3 and relies on a brand new ARM A15 Exynos processor, the quad core kind with 1GHz frequency. The Galaxy Tab 11.6 comes with a 5MP rear camera, a front 2MP HD cam, Android Ice Cream Sandwich with TouchWiz UX and a HDMI port, plus card slot. The slate will measure a mere 8mm, so it will be very thin and portable. This Samsung concept tablet is supposed to support a 2560 x 1600 pixel resolution and use AMOLED technology for its screen. The resolution rivals with the Retina Display rumored for the new iPad, but I guess we’ll have to wait till MWC 2012 to see the real deal. Some guys claim that they’ve actually seen this tablet in the backstage at CES 2012, but they weren’t allowed to take photos of it. 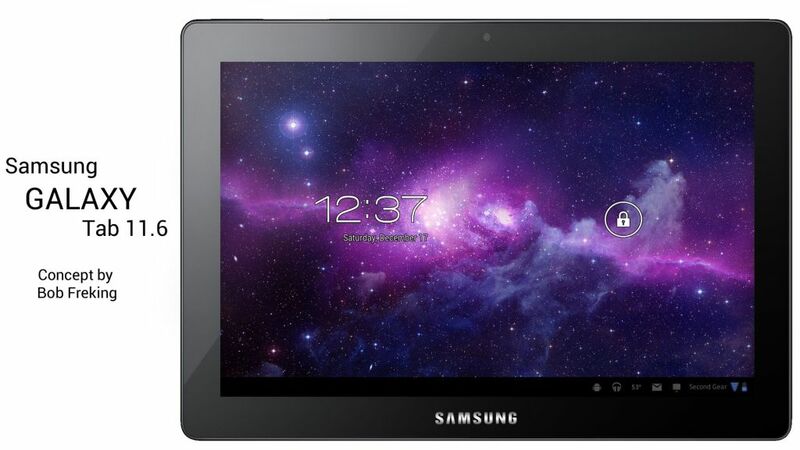 So, what do you say: would you buy a Galaxy Tab 11.6 or is it too big diagonal-wise?